This is the eleventh in a series of reviews of the best dive resort locations around the world. In this post, the focus will be Sogod Bay, Southern Leyte, Philippines. In addition to this series on dive resort locations, the best worldwide liveaboard dive locations and services are reviewed in their own series. To check them out, or others in this series, click on Liveaboards / Resorts on the menu at top and choose a a title from the list. Off the southern point of Leyte are Limasawa, where Magellan visited, and Medicare Islands with steep walls, deep canyons and rich coral reefs. There is a great variety of animal life including mandarin fish, turtles, eagle rays, frogfish, batfish, nudibranches, very large black and table corals, barrel sponges and gorgonian fans and the possibility of strong current. On occasion hammerheads are also sighted. Padre Burgos has some great shallow water night dives with intriguing creatures for the photographer like seahorses, frogfish, eels, octopus, and various crabs, among many others. Otherwise, there are abundant sweetlips, fusiliers, schools of barracuda, tuna and jacks and beautiful hard and soft corals and gorgonians. 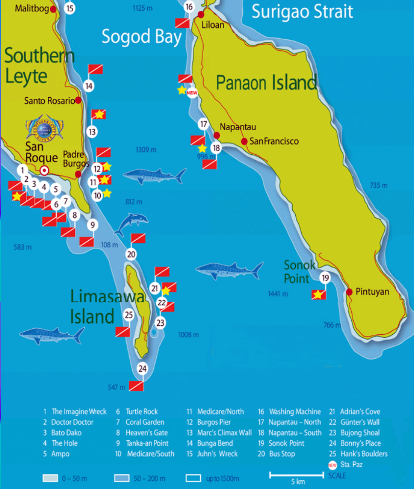 From November to May, Panaon Island and Sogod Bay are most famous for pelagics including whale sharks, dolphins and manta rays. The Napantao Fish Sanctuary has a large wall and when the current is strong there are similar large schools of fish and a generally very rich coral reef. A lot of Sogod Bay has not received environmental protection as much as places less out of the way like Anilao and Puerto Galera. However, 11 MPAs (Marine Protected Areas) have been created and fairly effectively protect and promote the undersea environment. No coral harvesting or cyanide fishing is tolerated anywhere in the Sogod Bay area. There is a crown of thorns starfish infestation in some places that is being addressed. It is always warm and diving is possible year round. Air temperature ranges from 80-96°F (26-36°C) and water temps from 80-86°F (27-30°C). 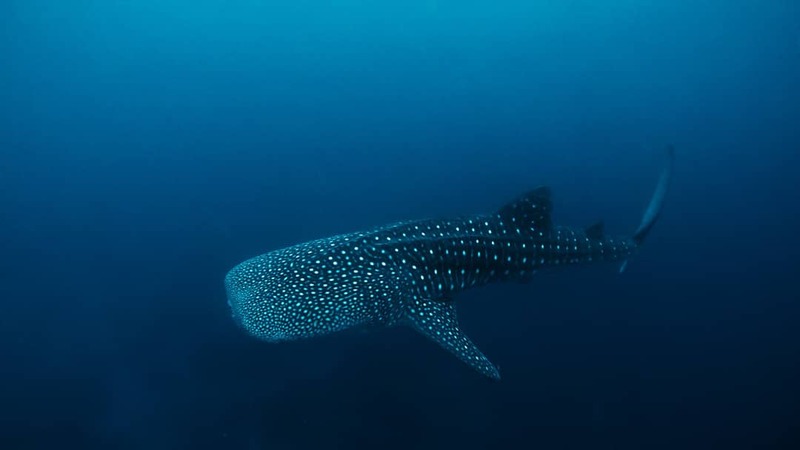 Seas are calmest from November to May and that is the best time to dive and to see whale sharks. From June to October the chance for a typhoon is greater with rougher seas and boats prevented from getting out, on occasion. Visibility is usually good and can reach 30 meters. After landing at Mactan International Airport, a 3 hour fast ferry service is available to Maasin, near Sogod Bay. Such a great site. I am so glad I found it. I have not had the privilege of scuba diving in the Philippines myself but these places sound perfect. I am going scuba diving in Fiji next month and looking forward to it. Thanks for writing this post. I am going to check out the others on your site now. Thanks a lot for you kind comments and interest. On the site I have a review of the diving around Fiji. If you haven’t found it already, please take a look. If you have any questions or ideas, I’d love to hear from you. After your trip, it would be great to know how it went. Although I have scuba dived in a few places around the world, I have never been to the Philippines or even thought about going there for some reason. 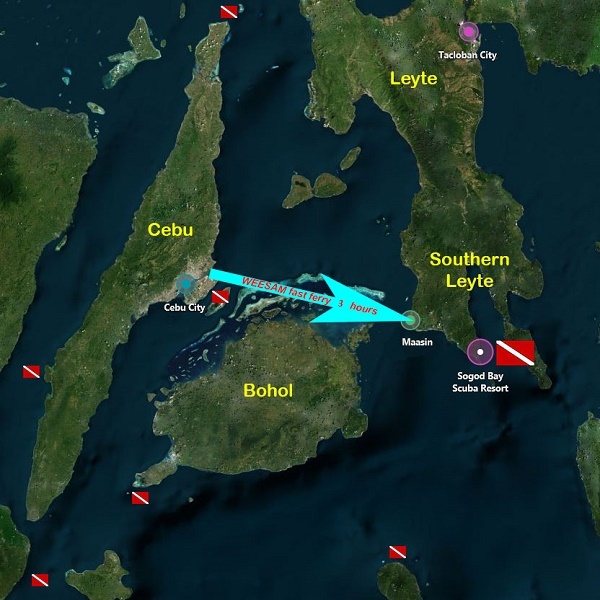 Recently some friends were telling me about their amazing experience of snorkeling with wild Whale Sharks in the little known town of Padre Burgos in Sogod Bay which got me keen to explore scuba opportunities in the area. Naturally when I came across your post it was with great interest that I read all the great info you cover. I have to admit it looks like paradise for someone like me who loves sea wildlife and I am now seriously planning on making a trip. Thanks for the inspiring details! If I have any questions I certainly know where to come and look for my answers first. Thanks a lot for your interest and kind comments. I hope you get the chance to go to Sogod Bay and share the water with whale sharks. When I swam with them I was amazed at how they seemed to be unfazed by my presence and allowed me alongside for a number of minutes. I’d love your feedback on your experience, when it happens. Please get in touch with that or any questions you might have.